It's never been easier to make the right decision! Are you struggling to choose between two things? Can't decide whether to go for that black or blue dress for the office party? iPhone or Samsung Galaxy? Fitbit or Nike+ FuelBand? New Zealand or Australia on your next vacation? 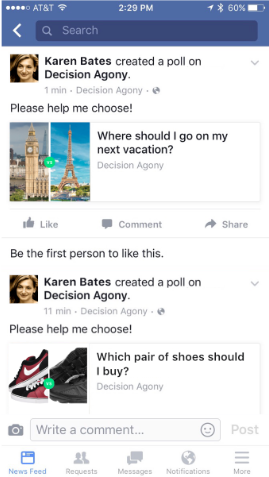 Let your friends help you make that decision by using Decision Agony! 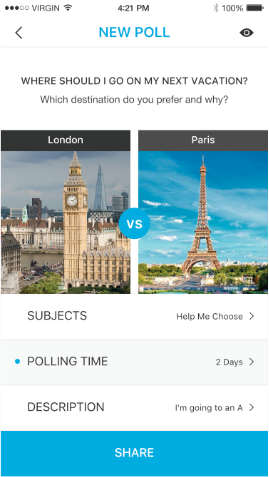 Decision Agony is an iOS app where you can upload photos of two things you are choosing between and add some information about the two options. You then share it on Facebook as a quick poll and let your friends vote on the option they prefer. 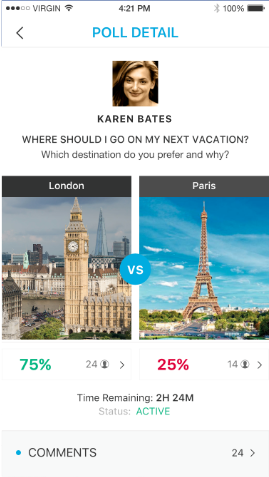 Decision Agony lets you track the progress of the vote directly in the app. You'll never have to make the wrong decision again!